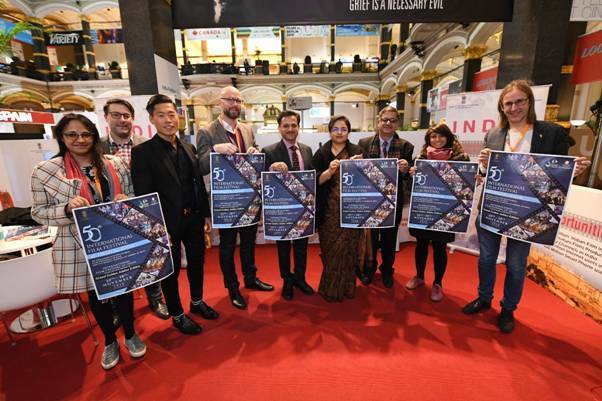 Berlin: The India Pavilion at the Berlin International Film Festival (Berlinale) 2019 was inaugurated by Director European Film Market (EFM) Matthijis Wouter Knol here in the capital city of Germany today. The Film Festival will continue till February 17. The poster of International Film Festival of India (IFFI) 2019 was also inaugurated by the dignitaries. Paramita Tripathi, Deputy Chief of Mission, Embassy of India in Berlin and Peter Domsch, Head of Sales & Technical Department, EFM were also present on the occasion. Speaking on the occasion, Knol said that the stakeholders of EFM will actively consider participating in the Golden Jubilee year of IFFI. Tripathi in her remarks said that the Indian Mission in Berlin would undertake constant engagement in future with Indian and German stakeholders at the European Film Market. The Delegation will also promote the Golden Jubilee edition of IFFI along with popularizing the steps taken to ease shooting films in India through Film Facilitation Office that facilitates Single Window Clearance for film-makers and provides the platform for ‘film tourism’ in India. Earlier in the day, there was a brief discussion between the Indian delegation and Carlo Chatrian, Festival Director Designate, Berlin Film Festival, regarding future collaborations of participating in IFFI Goa 2019. He expressed hope that there will be more active participation from the Indian Government and other stakeholders in the future editions of Berlinale.